Hyundai India has pulled up its socks to make no room for mistakes. 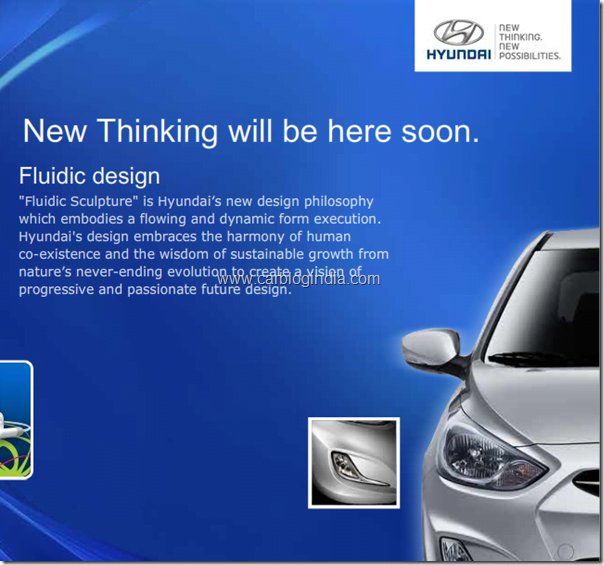 The all new Hyundai Verna RB 2011 is coming on 11 May 2011. The car was revealed last year at the Moscow Motor Show and since then it has been able to attract many eye-balls. The much refreshed and fluidic designed Hyundai Verna will replace the Hyundai Verna transform and will be a tough competition to the sedans like Honda City, Volkswagen Vento, upcoming Ford Fiesta 2011, Maruti SX4 and other sedans of this category. One of the lucrative offering with Verna RB will be four engine options to choose from. Those who like a frugal car can choose the low powered engine with higher mileage figures and those who want sheer power can go for the ones with higher power and torque ratings. With best in class mileage figures of upcoming Hyundai Verna RB and refreshed looks and features, it is sure to catch the attention of the value conscious buyers. Hyundai India has already launched a website with the glimpse of the car and is running promotional campaigns using Facebook and twitter pages.It is also accepting registrations for launch information when the launch happens, so that the interested customer can make bookings promptly. The new Verna RB has the DNA to give a tough competition to the upcoming Ford Fiesta 2011 sedan which will come loaded with some wonderful features like cruise control, ABS, high tech infotainment system and much more- Full review here. Stay tuned for the latest information on Verna RB launch by signing up for our free email newsletter and liking our Facebook page.